This will be the last post of a week attending to UID in the Northeast. The previous post, mostly for my clumsy misspellings of a fellow blogger’s name but also given substantive differences in how and why to write about Bangladeshi migration, and admittedly different stakes, generated a small bit of dialogue. If the themes of the week have been national erasure and migrant threat (Assam) and exemplary mass identification (Tripura), the article excerpted below addresses a persistent theme in reportage on the Northeast, combining figures of backwardness, irrational superstition, and the treatment of minority (here Christian) religion. It simultaneously evokes a genre of anthropological writing on the uncanny violence of capitalist transformation. Here, the ontological insecurity girding the terrifying threat of imminent devilry is not the entry into particular wage economies, but the ways the here closely associated UID and census force together the state control of property transfer and UID/census registration. I was initially cautious in reposting the article: the point is not to reprise the cosmopolitan pleasures of my discipline in securing the uncanniness of life on various margins. Or is it? 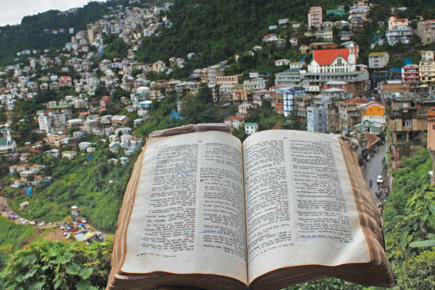 Aizawl : The fear of the ‘Beast’ or the Devil in the Christian-dominated state of Mizoram has caused almost 1,000 families to refuse to enroll their names in the National Population Register (NPR) taken up along with the Census 2011 here from May 15. The problem has stemmed from the Unique Identification Authority of India stipulating that none one could buy or sell property without the Unique ID card. According to adherents of the belief, since buying or selling of property made one a follower of the Beast, one having the UID card, which authorised property transactions, automatically made one a follower of the Devil. Those refusing to be enumerated belong to the Mizoram Presbyterian Church and the Baptist Church of Mizoram. Champhai District Magistrate Vijay Kumar Bidhuri said when he summoned Lalzawna the leader and high priest of a sect he was told that his religious belief would not permit him to register his name and he was ready to face any punishment. Serchhip Deputy Commissioner H told that adherents of the belief claimed they had thereligious freedom to disobey the government and were not afraid of punitive action. “They are not afraid of being prosecuted for their beliefs as they are more afraid of being identified with the Devil,” one enumerator said. The Presbyterian Church Synod, the highest decision making body of the largest Church in the state on June 13 issued a message to all members asking them to cooperate with census officials as it was the duty of every citizen to do so. “We (the believers) should not be afraid of the Beast (Devil), rather the Beast should be afraid of us as we believe in God who is more powerful,” the message said. The Church said that UID was important to identity bona fide citizens of the country and also help in identifying illegal immigrants and terrorists. The Church also condemned people who were issuing booklets about the ‘Number of the Beast’ to terrify church members. The message of the Presbyterian Church was read out in all church branches in the state, but there were still some who were skeptical, a church elder said. Enumerators were instructed by District Magistrates of all the eight districts in the state to identify those refusing to cooperate on religious grounds. The reports lying with five District Magistrates indicated that there were 939 families who have refused to have their names registered in the NPR, official sources said…. District Magistrate Bidhuri convened a meeting for people who refused to cooperate with the census officials on June 11 where only two persons, after being given explanations, agreed to cooperate with officials. The rest refused to budge from their stand even after the authorities told them that they could be fined up to Rs 1,000 and liable for imprisonment of up to three years. They were also informed that they could be deprived of their right to franchise, ration cards, works under NREGS and other benefits from the government. “As they have refused to believe our explanations, we may be left with no other option, but to take punitive action against them,” one official said. The fear of the Beast is not new among Mizo Christians as many of the sects and cults have refused to enroll their children in school believing enrolment would make them adherents of the Devil. Many have refused to have ration cards to avail rice at a cheaper rate on the same grounds even though most of them belonged to poorer sections of the society. This article is lodged on multiple sites across the Internet, along with others that tend to share or even sharpen the presumption of the irrational margin. If the Assamese situation often presumes the outsider as duplicating the citizen and her rights, if the broader conversation on UID presumes the generalized figure of corruption duplicating legitimate entitlement either from above or below, here the duplicate—if that is indeed the figure—is an accusation offered not from the center but the margin itself. The state’s enterprise invokes numeration in a way that doubles and threatens to collapse into the work of the Beast. At stake at first pass seems to be a form of life instantiated within the vitality, in Mizoram, of the Book of Revelation. But how might one take the accusation of the double seriously, for the moment? How does property governance, schooling, and identification come together in such a terrifying way? It is worth noting the violence of state response, abetted by mainstream churches, tracking and punishing non-registrants. The story is murky: it is not clear how the census and UID are organized in relation to one another, in Mizoram. But the punishment threatened seems wildly unlike the conditions for non-registrants in Uttar Pradesh, say. At first pass, again, the situation seems to be a highly paternalist and racialized legacy of “tribal” administration, setting up a high stakes game of moral certitude in which the equal force of the refusal of state demands to be marked makes more sense. And perhaps, the materiality of UID is more palpable here in the figure of the Mark of the Beast. I close with a second, longer piece, more extreme in its condemnation and force, followed by some musings on numbers, fellow Jews, and mysterious chicken. Kaptawni, a 44-year-old widow who sells second-hand clothes in Aizawl, looks at me with suspicion. “Why does he want to know all these details about me and my family? Is he trying to trick me?” she asks Zodin, the translator. Zodin tries to convince her that I am who I am—a journalist—but Kaptawni is not mollified. I know exactly what she is thinking: am I an agent of the Devil? Kaptawni is one of the 7,000-odd people in Mizoram who have refused to get themselves enumerated in the census. They are all ultra-orthodox Christians to whom the Unique Identification (UID) card project, a part of the census this time, means a plan by Satan to give humans the ‘Mark of the Beast’ as foretold in the New Testament’s ‘Revelations’ chapter. “The UID card is the first step. Soon, the Government will say that since it can be lost or forged, chips must be implanted in our foreheads or arms. That is what the Bible says will be the Mark of the Beast,” she tells me. My questions make her angry, but it is when we want to shoot her photo that she decides her suspicions are true. “No photographs,” she declares and ends the interview. T Pachhinga isn’t as unreasonable as Kaptawni. The 73-year-old former constable with the Railway Protection Force is willing to talk, and is even ready for a photo. “The UID card will mark us for the Beast. The Bible says that whosoever is thus marked will burn in hell,” he says. Pachhinga belongs to the Presbyterian Church where no one else, including his wife and three adult children, agrees with him. “They don’t understand,” he says. “I know I won’t get the UID card. Maybe I won’t be able to do many things, like bank transactions, draw my pension, get medical treatment or even book a railway ticket. But I’m willing to bear the consequences. I’ve transferred everything in my wife’s name so that my family doesn’t suffer. I’m ready to suffer. I know the Lord will save me.” Pachhinga has a repertoire of Biblical verses to back him. For instance, Revelations chapter 14, verses 9 to 11, which warn against receiving the Beast’s mark. Kapzuala, 46, an evangelist with the Church of God, another local Protestant denomination, says he’s fine with the census but not the UID project. “I’m opposed to giving my biometric details and being given a number,” he says. He has a voter’s ID card. Doesn’t that also have a number? “The two are different,” he tells me, but refuses to explain why. Professor C Nunthara, vice-chancellor of the Shillong campus of William Carey University, has also written against it. “There is absolutely no connection between the UID Project and Biblical prophecies. I have explained that repeatedly in articles,” he says. The Presbyterian Synod issued a statement on the same lines. Church elders and pastors have tried speaking sense and the Government has held seminars to clear misconceptions, but it has not helped. “How about China, an emerging global superpower?” I ask him. “Very likely,” he says, warming up to the idea. Then he sees the camera and his mood turns agitative. We try to cajole him into a photograph, but he won’t even be clicked from the back. Abruptly, he starts talking of his past. “I used to drink a lot and was a street fighter till six years ago. I bashed up many people and was also behind bars.” It’s a loud hint which we take—and leave. Grateful to the reporter for the courtesy at least of his travels and interviews, I am frustrated at the illiberalism of his honesty and presumptions of backwardness. So three last thoughts. 1) The cosmopolitanism of rumor: what is at stake, for some interviewed, is a sense of risk tied to identification as a globally penetrating form, tied to occult fears precisely in the conjunction of its massive scale and its intimate fixation on, and soon in (the implanted chip) the body. The voices of reason argue: but it is simply a number (thus, paraphrasing Michael Taussig, the devil and identity fetishism). You use numbers and allow yourselves to be used by them all the time. What is the difference here, with UID? But the proponents of UID have long given it magical qualities, the vehicle to end corruption and eliminate poverty through de-duplication. In opposition, then, we have the terrifying double, far more terrifying than the film double of Manu I discussed in an earlier post on the film Duplicate. 2) The number, the mark: I recall a drunken conversation, some years ago, with Martha Selby and Daud Ali, in a Mylapore bar, on the mysterious enumeration of Chicken 65. Many others over the years, variously inflected by intoxicants, have had similar discussions on this South Indian non-veg classic and its name. This led Martha and I to discuss a project on the life of numbers. Perhaps this is my first stab. 3) The sect, the Jew: The relation of sectarianism to duplicating claims, in Mizoram, is not particularly new. I have long followed claims by my Mizo and Manipuri co-religionists to Jewish “rights of return” to settle in Israel, dismissed by many guardians of authentic Jewishness. As in Andhra Pradesh, Jews tend to appear in particular zones of intense post-mission sectarian Christian millenarianism. But if there is a particular local history to the sectarian, in Mizoram, it is again and again articulated to something of far greater scale, whether the deferred promise of Zionism or the embodied threat of the imminently universal mark. The last posts suggested some concerns around Aadhaar and Universal ID in Assam circulate around a second figure of the duplicate—not the cheater whose proliferating instances of identity must be de-duplicated, but the presumptively illegal Bangladeshi migrant whose passing as an Indian citizen may be legitimated if s/he gains access to an Aadhaar card and identity. Much of both popular and expert literature on the effects of migration across the Assamese-Bangladeshi border is neither dispassionate nor particularly empirical. A problem is proposed—large scale illegal migration and “land grabbing”—but few local studies helping to specify the stakes either in border districts or large towns and cities are cited. Such studies may exist—these questions are new for me—but an unscientific survey of several dozen policy or news reports through the medium of the Internet has not yet revealed them. What does clearly exist is a language that moves quickly into the specter of a national struggle between the Assamese and the Bangladeshis, a struggle framed both in a language of demographic invasion and cultural genocide and, iteratively, as a struggle over Islamicization and de-Hinduization. Hindutva groups like the VHP [Vishwa Hindu Parishad, see the classic article by Jaffrelot in Dalmia et al] are not surprisingly perhaps well-represented in debates over the disappearance of Assam; but the range of commentary is far broader. It would be unfortunate if my point was taken as a dismissal of the effects of large-scale migrations. If the tenor of the debate tends toward the inflammatory, framing the migrant through a presumptive psychology of a rapacious “land hunger,” part of the challenge is to understand the conditions of this slippage. In this context, UID is debated as a means either to establish security and identify the false claims of the migrant, or as a failed enterprise in being conceived not as a register of citizenship but rather residency. Some articles focus on the technical and historical conditions of UID’s database and its complex relation to census instruments, but most focus on the politics of the ruling Congress-Party led alliance as it gears up for elections and courts “vote banks”: here the presumption is that Congress needs the “minority [Muslim] vote” and that its attitude toward UIDAI reflects the contingencies of not seeming too harsh on Muslim migrants. What emerge are a set of challenges to UIDAI, presumed by articles, reports, and blog posts either to be responses by parties in power to electoral considerations by weakening or attacking UIDAI, or to be responses by parties out of power and especially the Hindu nationalist parties to UID’s claimed role in weakening proof of citizenship and thus weakening state security. I have elsewhere termed such a political imaginary “the nexus”—in that any position toward an institution, here the UIDAI, is taken to reveal a prior set of “vested interests” benefiting the powers behind a political formation. What is interesting is that rival visions of the impact of migration and of state response may both be organized around a critique of UID /Aadhaar. Rather than detailed commentary, let me just throw out a brief discussion of and citation from 2 citations that exemplify this range of problematization and the shared critique of UID. You might think I am quoting a contemporary BJP leader. These are, in fact, words of C S Mullan, census commissioner under the British Raj. He made these comments in 1931. If you thought that the issue of “illegal immigrants from Bangladesh” is a recent one, then think again. Demographic change in the erstwhile Assam province in the first half of the twentieth century was at the heart of the Muslim League’s demand, in the 1940s, that the territory be given to Pakistan. So those who argue that large-scale immigration from Bangladesh is one of the biggest long-term threats to India’s national security are right. Nitin’s move is interesting: he differentiates himself from the Hindu nationalist BJP and grounds his concern rather in the colonial era census. In other words: reason, not passion, should guide a planned response: thus work permits and UID as the solution as opposed to the violent means advocated by some. And, the positive: use the Indian UID to assess who is really a citizen. Vote-bank politics, by which Nitin like many commentators suggests the Congress Party soft-pedals control of Bangladeshis to garner the needed Muslim vote in its coalition building, have garnered the dividends of Congress (neoliberal, non-Hindu nationalist) Rule. Here Nitin identifies with these dividends, but marks a limit in the figure of the migrant. The security threat of Bangladeshis flooding in must be tackled. But the solution extends the liberal promise of Congress through the rationalized distribution of cross-national labor through cross-national biometrics. In contrast, Mr. Bhagwat notes that UID is not organized around citizenship rolls and therefore cannot function to address any security issue here. I am pretty certain he [Nitin] realises that UID is not about citizenship – it is more about establishing an “identity” – and to the best of my knowledge, it is going to be based on the National Population Register. The population register is not the same as a record of citizens (or citizenship) and it would therefore be wrong and misleading to use that as the basis for establishing citizenship (the fact that this is exactly what is very likely to happen is a topic for a separate discussion). This concern [staged in Husain’s signifiably Muslim but Indian and Assamese voice, again not in a Hindutva voice] makes Bhagwat wonder if the regularization of work permits is enough. He leaves the alternatives unvoiced. Watch and hit hard. Don’t slacken off, ever. Boycott them. Track them relentlessly. 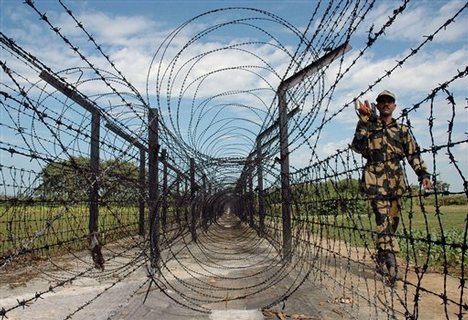 Recently, with the threat of imminent violence in Assam, a lot of infiltrators fled back to Bangladesh. They [those who threatened this imminent violence] could take lessons from the Sena, maybe even some help. Liberty does not come cheap. Here, a rational-liberal discourse of formalizing illegal/informal migration marks its own limit in the difficulty of keeping population based and citizenship based form of surveillance separate. At that limit, if Seadog can be taken to mark the effects Mr. Bhagwat’s silence both potentiates and elides, calls for extreme violence may proliferate. There are lots of illegal immegrants from pakistan and bangladesh. This comes to many millions, with UID, everyone is going to get legal ID for them. which is very dangeros for the countries security. Question is how to identify them, Indians borders were opened all these years. It is unfortunate. In Assam there were only 2% minorites, today some analysts are mentioning this figure is about 35%, how did this happen?. UPA government is playing Vote bank politics , compromising on counrties security. Behind this claim, however, one might need to ask what other kind of politics exist. There seem to be two kinds of political theory that haunt such a claim and resistance to it. More recently, there is the much discussed argument of Partha Chatterjee that “most of the world” in its ever burgeoning squatter-settlement global cities inhabits a form of “political society” in which relations with state agencies and other powerful formations must be negotiated by informal, brokered, aggressively collective, often criminalized means (the squatters and illegals need the means to live and thrive and entertain self-respect; what I am calling the powerful formations need to govern the population and its milieu), as opposed to “civil society” with its formals and legal relations to land (ownership and tenancy and taxation) and labor (taxation and regulation) and electoral, individualized politics. Surely the blogs cited above are haunted by the potential collapse of local civil society (but here linked to the racialized imaginary of the nation) and the need either to through the identity card create some intermediate position between the fully formalized and the dangerously proliferating informal migrant, or, through threats of imagined counter-violence, to descend to the presumed level of political society. But there may be another trajectory, through the sociologist M. N. Srinivas from his 1955 concept of the vote bank and a series of debates on the “demand polity” that emerge in conversation with him. This trajectory may offer other ways to think through UID as it gets pitched as the failed (duplicate?) protector of civil society. This trajectory may not exercise in the same way the presumptive and for me deeply flawed sociology of “India” as a persistently split entity, here between the dualism of political and civil society.